The redback spider (Latrodectus hasseltii) is a species of venomous spider indigenous to Australia. It is a member of the cosmopolitan genus Latrodectus, the widow spiders. Mainly nocturnal, the female redback lives in an untidy web in a warm sheltered location, commonly near or inside human residences. It preys on insects, spiders and small vertebrates that become ensnared in its web. It kills its prey by injecting a complex venom through its two fangs when it bites, before wrapping them in silk and sucking out the liquefied insides. Male spiders and spiderlings often live on the periphery of the female spiders’ web and steal leftovers. Males live for up to six or seven months, while females may live between two and three years. 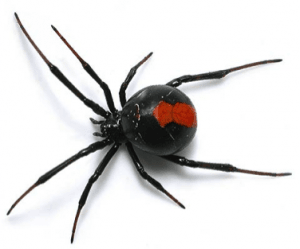 The redback is one of the few spider species that can be seriously harmful to humans, and its preferred habitat has led it to being responsible for the large majority of serious spider bites in Australia and is particularly neurotoxic to vertebrates. Food scraps and lighting attract insect prey to areas of human activity, which in turn bring the redbacks to the same “human living” environments. 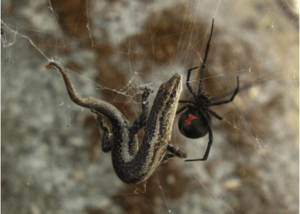 From a Barwon Health article written by Dr Julian Stella, “Spider bites are not an uncommon entity in Geelong…especially in the warmer months”. Red back spider bites are well represented in the region, and are easily identified by severe pain in the local bite area. This pain can often spread to significant proportion of the body and usually includes the lymphatic system. Symptoms can also include hypertension [high blood pressure], nausea, abdominal pain and severe headache. “Prolonged events may require emergency treatment in the ED of specific antivenom”. There is an established population of redback spiders in Osaka, Japan, thought to have arrived in cargoes of wood chips. In 2008, redback spiders were found in Fukuoka, Japan. Over 700 have been found near the container terminal in Hakata Bay, Fukuoka City. Dispersal mechanisms within Japan are unclear, but redbacks are thought to have spread by walking or by being carried on vehicles. In September 2012, a woman was hospitalised after being bitten in the Higashi Ward of Fukuoka City. Signs warning about redback spiders have been posted in parks around the city, as Japan previously had no dangerous spiders. The redback spider is responsible for far more envenomations requiring antivenom than any other creature in Australia. Estimates of the number of people thought to be bitten by redback spiders each year across Australia range up to 9,500 or 10,000. Rare complications include seizure, coma, pulmonary edema, respiratory failure or localised skin infection. Children, the elderly, or those with serious medical conditions are at much higher risk of severe effects and death resulting from a bite. Infants have died within hours of a bite, but adult fatalities have taken up to 30 days. Children and infants may be unable to report being bitten, making it difficult to associate their symptoms with a spider bite. Symptoms seen in infants include inconsolable crying, refusing to feed and a general erythematous rash. [b] Muscle aches and pains, and neck spasm are often seen in children over four years of age. Severe pain usually persists for over 24 hours after being bitten, and symptoms of envenomation may linger for weeks or even months. Here is the kicker, some patients who have had a Redback spider bite have taken months or years to recover from depression. Some have become suicidal and taken their own lives due to the effects of prolonged pain and onset depression. Based on the toxicity of LD 50 of 0.27–0.91 mg/kg one average [0.08–0.10 mg of venom] can kill 200 to 300 mice. Best solution- call Acacia Pest Control, we can put a big lid on the potential of any spiders surviving on your property for 6 to 8 months.